These days we have Audyssey Dynamic EQ. 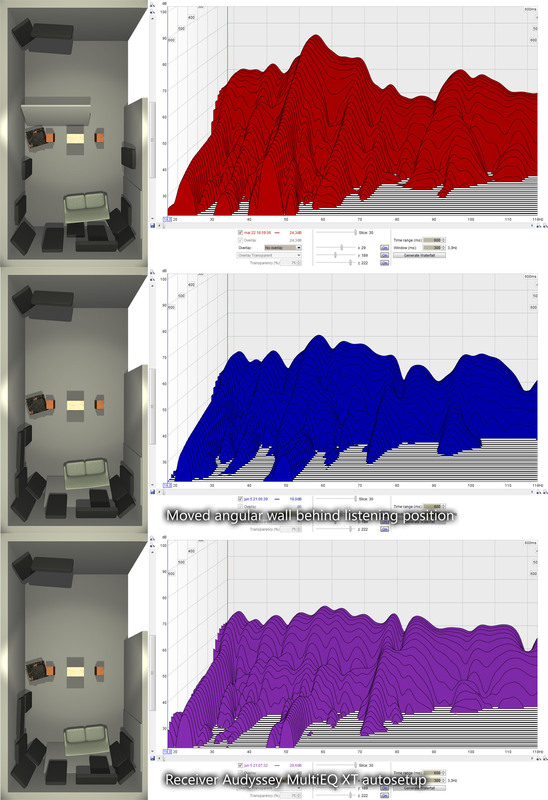 This is a digital dynamic equalizing of the sound relative to movie reference levels. With it on you can listen at any volume level and hear what the mixer intended. There is a term called “house curve” that home theater enthusiats have used in the past to make home cinemas sound better, but you don’t need this any longer if you have a dynamic loudness eq, or a similar dsp circuit. If you want good sound like they have in the cinemas, like flat frequency response and tight bass, your listening room will usually need treatment. There are two types of treatment. The first is early reflections, the second is modal ringing. Early reflections is when sound is reflected in the side walls and ceiling, and mixes with the sound that come towards you from the speakers. 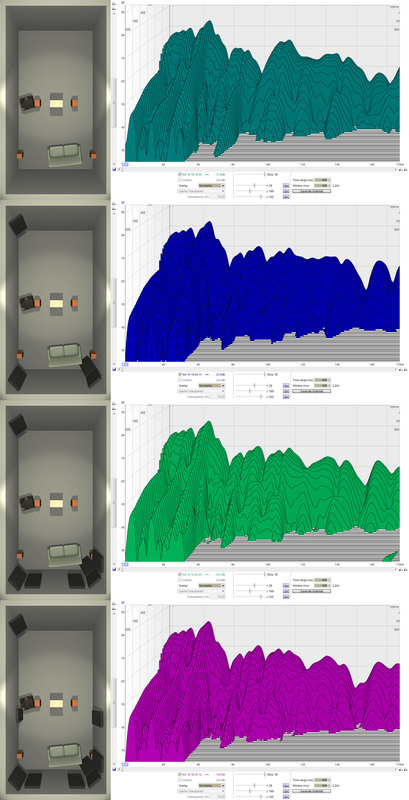 The second is low frequency sound being reflected in the walls and ceiling and meeting up at different places. These meeting places the sound will either null itself out or strenghten. Due to the dimensions of the room and the lenght of the sound waves, they will meet at different places all over the room. They will also bounce back again and last for a while and thus sound muddy. To combat these problems one can use sound traps. Heavy rockwool is placed at different places to absorb the sound, creating a clearer and tighter sound that is easier to listen to – like the have in the Cinemas! 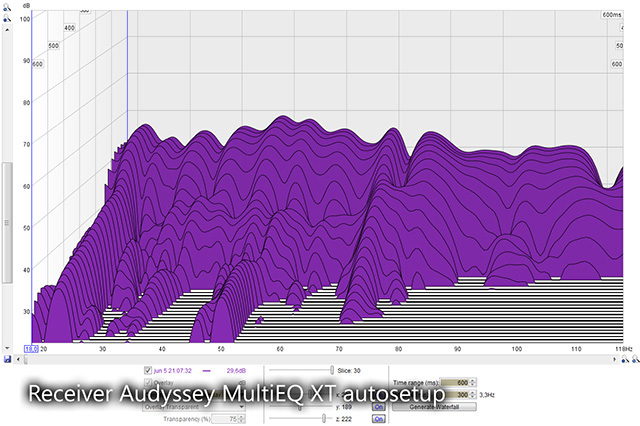 There are equalizers and auto-setup room correction like Audyssey MultiEQ XT, but they don’t work very well and due to their nature simply can’t eliminate early reflections, muddy bass and nulls. And if you move your head slightly, or have visitors in other listening positions, the eq is all out of whack, or you have to reduce their listening positions frequencies too. I have set up some early bass traps that are not finished. The worst frequencies are horrible and are still there, 20hz, 32hz and 42hz. Above that it looks pretty good except the dip at 140Hz. I need to finish the traps and hang them up at the ceiling corners where they should be and where the nasty frequencies below 50Hz resonate. 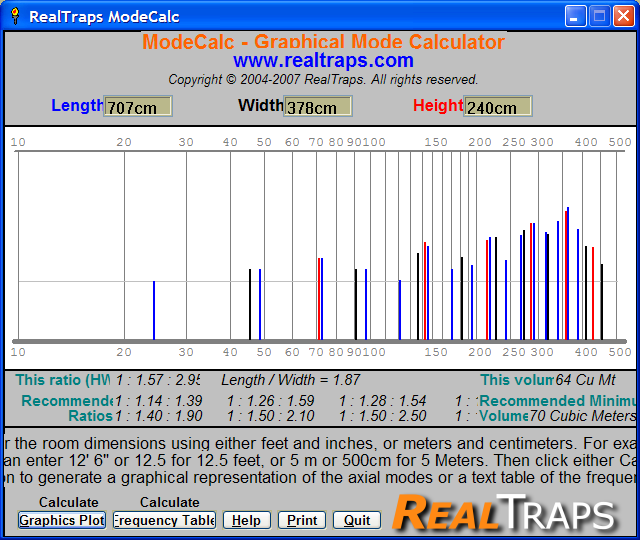 With the traps I got so far standing around I get some improvement at 42hz and 70hz and eliminating a null at 79hz. You can see which frequencies is problematic when they have a long hill. The depth is how much they bounce back and forth and the height is the volume. If you have round or angular walls, this should also be very good for the acoustics I belive. You can play a 20 to 80hz test tone sweep and hear if you have any peaks or nulls in the bass response. You can also walk around the room and hear where there is the most bass, probably in the corners and ceiling/wall corners, and know where to place the bass traps for most effect. Walking around the room you can also hear where the different frequencies meet and either peak or cancel themselves out. I’ve moved the half-wall and used a receivers auto-setup “room correction” to even out the response and now the bass sounds very even in all movies I have tried till now which is very nice. Before I had to adjust the bass depending on the movie. But the bass is still muddy at the ringing frequencies which an equalizer naturally cannot do anything about.